In May 2014, CUL uploaded 398 items into our CONTENTdm collections. CUL now has approximately 38,289 published items. 2 items from the George Albert Converse Papers and Photographs, including the 17-page Specifications for Illuminating Outfits for Ships of the U. S. Navy, 1903, and Description and Tests of Electrical Appliances, Monitor No. 10, U.S.S. Wyoming, 1902, a 136-page document consisting of test reports, descriptions, information, and blueprints relating to the U.S.S. Wyoming with sections on Turret Turning Gear; Endless Chain Ammunition Hoists; Ammunition Whip Hoist; Ventilating Sets, Long Arm System – W.T. Doors; and Name Plate Data – All Motors. 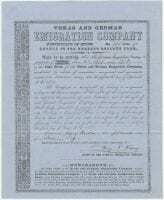 Texas and German Emigration Company Certificate of Stock, June 15, 1859. The share is signed by Henry F. Fisher, one of the leading figures in the German Texas colonization. 44 documents from the Collection of Adelsverein Documents, 1845-1864. This collection includes documents relating to the German colonization of Texas and the Adelsverein, also known as Society for the Protection of German Emigrants to Texas (Verein zum Schutze Deutscher Einwanderer in Texas). The Adelsverein brought thousands of German emigrants to Texas beginning in 1844. These documents include land grants, emigration contracts, promotional materials, and fiscal documents. 78 non-oil-related Texas negatives, 1951-1952, by Robert Yarnall Richie as part of the TexTreasures FY2014 grant, bringing the total number to 950 negatives for the FY2014 grant. Companies and organizations depicted, or as clients, include Southern Pacific Railroad, Southland Paper Mills, Inc., United Carbon Co., and Texas Gulf Sulphur Company, Inc. Notable images include the Pecos River High Bridge and Historical Marker; Diesel Locomotive No. 206, Sunset Limited; Silver Spike, Southern Pacific Railroad; Work Crew for Southern Pacific Railroad; views of Aransas Pass Plant; aerial views of Houston; the Shamrock Hotel; Prudential Building Construction; E. A. Craft Ranch; and the Newgulf Production Plant and Airport. 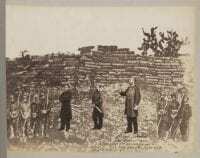 [Last Words of Maximiliano, ‘Mexicans may my blood be the last that spills and may it restore this unfortunate peasant’], 1867, a photomontage depicting the execution of Emperor Maximilian and two of his generals at Santiago de Queretaro on June 19, 1867, by Adrian Cordiglia from the Thayer-Nagle Album of Scenes in Mexico. Thayer-Nagle Album of Scenes in Mexico, containing 50 views of tourist interest along the Ferrocarril Mexicano (Mexican Railroad) in Orizaba, San Marcos, Tlapacoya, Castillo de Chapultepec, Amecameca, Mexico City and Veracruz including tracks, bridges, mountains, tunnels, cathedrals and the Museo de Nacional de Mexico. 17 builder’s specification cards from the Baldwin Locomotive Works Builder’s Cards, including several from the Carolina, Clinchfield and Ohio Railway. 19 Baldwin Locomotive Works Extra Order Books, 1890-1909, containing orders for locomotive parts from the owners of the locomotive in the order. These orders can be used to document ownership of the locomotive, as well as configuration changes in the locomotive. Manchuria, ca. 1903-1919, from the Views of the Chinese Eastern Railway. 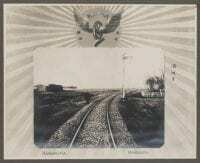 47 photographs from the Views of the Chinese Eastern Railway album, ca. 1903-1919. The photographs depict depots, railroad shops and yards, buildings, car interiors, tracks, health resorts, and other views along the line. Captions for the photographs are in Russian, Mandarin, and English. The Chinese Eastern Railway is the Trans-Manchurian line of the Trans-Siberian Railway that runs from the Transbaikal region to Vladivostok. 11 real photographic postcards of the Tulsa Race Riot, showing the racially-based violence that took place in the Greenwood District of Tulsa, Oklahoma, on May 31 and June 1, 1921. Pictures illustrate the devastation to the African American community, including whole blocks burned to the ground, bodies of victims, and the convention hall. Hot Spring and Castle Geyser by William Henry Jackson, from Photographs of the Yellowstone National Park and views in Montana and Wyoming territories, published in 1873. 58 issues of The SMU Campus, SMU’s student newspaper from 1948. Highlights include an April Fool’s Day edition and the introduction of radio station KSMU. 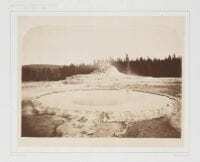 Photographs of the Yellowstone National Park and views in Montana and Wyoming territories, a book containing 50 mounted photographs taken by William Henry Jackson for a United States Geological Survey landscape survey conducted in the Yellowstone region in 1871. Jackson’s photographs helped convince the U.S. Congress to vote for the Yellowstone National Park bill in 1872. Each photograph is accompanied by a guard sheet with descriptive letterpress. This entry was posted in George Converse Papers and Photographs, Mexico photography, Railroads, Robert Yarnall Richie, U.S. West. Bookmark the permalink.